You have a great opportunity to work on both rentals and sales at Mont Sky. We highly recommend new agents to learn how to use Nestio (our current RLS vendor) and to learn how the rental market works. Rental transactions are much faster to complete versus sales transactions. A typical sales deal can take 30 to 90 days to close after a purchase contract has been fully executed. And it may take months of searching with a buyer client before you even make an offer that is accepted. Therefore, it’s important to make sure you have more immediate income by working on rental deals on your own. You should familiarize yourself with a neighborhood or two of your choice and preview as many properties as possible. Most rental buildings run by management companies offer tours to anyone who walks in. You may even be able to keep a set of keys by leaving a copy of your pocket card (i.e. real estate license). You should remember to take some high quality photographs of the apartments you see. Individual units in large rental buildings will often have different finishes from each other. 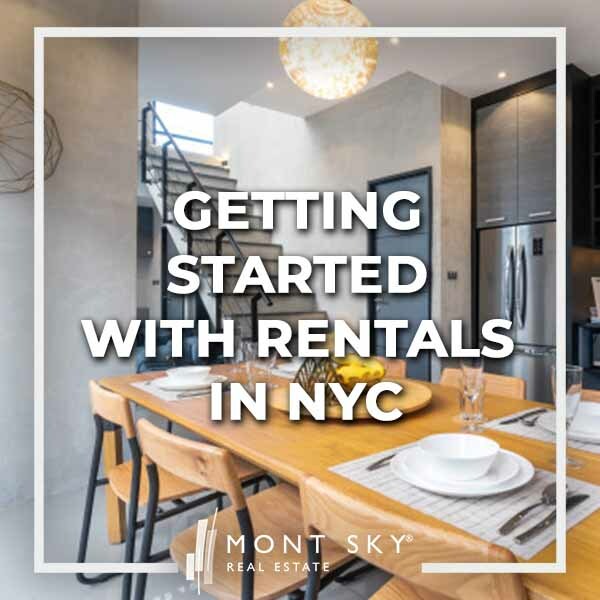 Getting started with rentals in NYC is a breeze with Mont Sky’s listings search and syndication software. Our tools are state of the art and backed by institutional capital. Best of all, supplement your rental business with in-house buyer and seller leads! You will be able to syndicate “open listings” of apartments posted for rent by management companies. That means you do not need an exclusive listing agreement with the landlord to be able to advertise their property. Therefore you should use the photos you’ve taken along with a unique property description you’ve written to post the listing under your name on the various real estate search websites that Nestio syndicates to. This way, when an interested tenant sees your advertisement, they’ll contact you directly so you can show them the apartment! You’ll notice that most management companies do not bother to put any photos up on their listing. That’s because they know agents will take their own photos! In the off chance that a management company listing does have photos and a description, you are free to use it but we suggest at least switching around the order and re-wording the description so it stands out. Many other agents will be doing the same thing so if it looks identical to others it’ll be less likely that you’ll get contacted by a tenant. That’s why it’s always better to use your own photos and description! Pro Tip: You can filter on Nestio for only listings that you’re able to syndicate. This will exclude exclusive rental listings by other brokers. You will be receiving inquiries from interested tenants once you’ve posted some open listings with great photos and descriptions. The most obvious way to earn commission is to show them the apartment they’ve inquired on. If they’re interested in renting it, you simply need to contact the management company for any applications, fees or forms your client will need to fill out. Don’t forget to present a disclosure form to your new rental client! You can improve your odds of closing a deal with the lead by offering to show them similar listings as part of a tour you can arrange. The best way of finding out exactly what they’re looking for is to get them on the phone. In addition to the NY agency disclosure form referenced above, you should also present the tenant with a rental showing agreement, especially if you are showing apartments that are listed as CYOF (Collect Your Own Fee) or landlord buildings that are publicly advertised as no fee. This will be for your own protection in case a prospective tenant decides to try to circumvent you and go directly to the landlord after you’ve shown him or her the property. You’ll notice that many of the listings in RLS (REBNY Listing Service) are by other brokers. You won’t be able to syndicate these but you can certainly email them directly from Nestio to your tenant clients. You will see what commission is offered (i.e. co-broked) to Mont Sky for each listing in RLS. RLS data is viewable through vendors like Nestio, RealtyMX, RealPlus and OLR. While the co-broke offered in RLS is contractual between REBNY Member Firms, mistakes do happen and it’s best to get confirmation in writing if you’re unsure. There is no co-broke offered by the listing agent in Collect Your Own Fee (“CYOF”) listings. However, you are free to collect a commission directly from the tenant. Commission rates are negotiable and there is no mandatory rate; however, 15% of one year’s rent is fairly common in the NYC market. Landlords have typically paid a fee to the listing broker directly in return for their help in advertising their property. Therefore, the listing agent does not expect to get a split of the fee you collect from the tenant. This is a common commission structure for exclusive broker listings that are higher priced, more unique or simply harder to rent. The co-broke here will be familiar to those of you who’ve worked primarily in sales. The total commission will be paid by the landlord and will be split 50/50 per REBNY rules between the listing agent and the tenant’s agent. You will be able to see the commission amount offered to Mont Sky in RLS. Again, commission rates are negotiable and can vary, but 15% of one year’s rent split equally between the agents is fairly common. Sometimes a listing will mention Owner Pays (“OP”) as an incentive. In this case the landlord or property manager will pay the broker. This does not preclude you from still collecting a fee from the tenant; however, some owners make it very clear that they are paying a fee so you could encounter an awkward situation at lease signing if it becomes clear to all parties that you are receiving a fee from both parties. OP listings can be a great option for tenant clients that really can’t afford to pay a broker fee or a close friend you want to do a favor for. Sometimes rental buildings will offer a custom fee arrangement which you can choose. For example, a building might offer “1 month free or 1 month broker OP.” What this is saying is that you can either offer the tenant one month in free rent and still collect a fee from the tenant, or you can reduce the fee charged to the tenant and collect a fee from the owner equal to 1 month’s rent. Apartments can be advertised as either Fee or No Fee on public real estate search websites. If a property is listed as Fee then the tenant will be expected to pay a broker’s fee. If it is listed as No Fee then the tenant won’t be expecting to pay a fee if they see the listing. Keep in mind that many listings in RLS by either brokers or management companies may say CYOF but be advertised publicly on sites such as StreetEasy as “No Fee.” Therefore, it can be a difficult conversation to have if your tenant client just searches for the address and sees that it is No Fee. However, tenant clients will typically understand your value and pay you a fee anyway if you’re working with them on a full time basis. Remember that New Yorkers are busy working professionals, and most of them will be glad to work with a real estate professional like yourself who can guide them through the process and show them apartments that are actually available! As a broker with access to RLS, you have an unique advantage in being able to only see exclusive listings and original building management listings. You don’t have to wade through thousands of open listings posted by other brokers and can save your tenant client a lot of time in being able to schedule directly with owners and exclusive listing brokers. Furthermore, you bring value to the table with your neighborhood expertise, ability to negotiate on their behalf and your knowledge of the rental application and lease signing process!